We started day two of our Nashville adventure in the east part of Nashville known as the Fatherland District. This trendy neighborhood is home to hip restaurants, cool shops and hot entertainment. Merri, Julie and I hopped in our Uber ride and met Luanne for brunch at a very busy little joint called Sky Blue. Sky Blue is tiny, so my first advice is, get there early. They don't take reservations or call ahead seating, so expect a wait time. But, don't despair. The wait is totally worth it. The portions are huge and the menu is varied, so there is something for everyone. Merri and Julie decided to order two different entrees and share so they each got something sweet and something savory. They settled on brie stuffed french toast and a breakfast sandwich. I think we all agreed the brie stuffed french toast was the best thing any of us ordered. It was divine! I went Tex-Mex with a steak burrito. It was enormous and tasty and so were the hand-cut fries. Luanne got a crazy, humongous sandwich made of pancakes and stuffed with eggs, cheese and bacon. I took a picture from both sides, so you could see all of the ridiculous goodness. After our breakfast, we strolled around the rest of Fatherland District, checking out all the quaint little shops. We got our chocolate fix at Chocolate FX. We each got an assortment of truffles and toffees and loved each and everyone of them. Tip two...go to Chocolate FX and load up! We moseyed into Galena Garlic on a whim and I thought we would never get out! You know how it is when you go into a Hallmark shop and you start reading all the funny cards and just cannot stop? Well, the Galena Garlic experience is kind of like that only you are not reading card after card. You are tasting vinegar after vinegar! I have never tasted so many different kinds of balsamic vinegar and olive oil. We ended up buying so much we had to have it shipped back home. I especially loved the coconut and vanilla vinegars and basil olive oil. Merri got lemon-mint and pomegranate vinegars and rosemary olive oil. Julie ended up with blackberry-ginger and apricot vinegars and a bunch of handmade soaps. The thing is, with these delicious vinegars on your salad, you don't have to have any other dressing. Delicious. Along with the vinegars, olive oils and handmade soaps, Galena Garlic also had pouches of mixed dried seasonings to spice up your recipes. Tip three...visit Galena Garlic, but be prepared to stay awhile! We visited Lu's daughter, Caroline. Caroline is a Nashvillian now and she works part time in the district at an eclectic little shop called Rusty Rats. The place is full of vintage finds. If you visit, please tell her, "hi!" from her mom and me. We left Fatherland and ventured downtown to a quirky store called Two Old Hippies. This expansive store was full of clothing, jewelry, musical instruments and lots more. We had lots of fun poking around here. From Two Old Hippies, we called our Uber driver again and hitched a ride to Centennial Park to check out the Tennessee Craft Fair. We strolled around the shady park checking out all the beautiful handmade arts and crafts. We found ourselves especially drawn to the many vendors selling gorgeous jewelry. Julie and Luanne both scored some amazing pieces. The little guy above watched over the event from his lofty perch in this tall catawba tree. After our walk through Centennial Park, we Ubered ourselves back to our room to freshen up and then we headed to dinner. We had reservations at a beautiful restaurant in an old theater called, Sinema. Sticking with the cinematic theme, Sinema had old movies playing on large screens above the tables and the place was decorated with old movie advertisements and photos of famous stars. Sinema is a white table cloth kind of restaurant, so Tip four is dress accordingly if you decide to dine at Sinema. We began our Sinema experience with cocktails. The drink names were all inspired by different movies or stars, which we loved. Merri had a Style and Grace with Cathead Vodka, Merlet Creme de Muire, lemon, mint and sparkling rosé. Luanne went with a Crouching Tiger, Hidden Cucumber which involved gin, lemongrass, lime and cucumber. Julie ordered a Caribbean Queen with rum, honey, lime and grapefruit. I ended up with How Rande met Cindy, composed of vodka, St. Germain, pineapple, cayenne syrup and lemon. After tasting each of the drinks, we all agreed Julie's Caribbean Queen was the best. While we enjoyed our drinks, we nibbled on this crusty fresh baked foccacia with an herby white bean butter. It was so good! Then we got down to business and selected our entrees. Julie had this beautiful dish of red curry dumplings. It was unusual and delicious! Merri had an airline breast of chicken over grits, greens and cranberry beans. Luanne had the fresh catch. I think it was cobia. I had a luscious vegetarian pasta dish with veggies, homemade pasta and fresh mozzarella. The Lime in the Coconut, a heavenly combination of coconut glazed lime cream filled doughnuts with coconut lime sorbet. Divine! After dinner we met Merri's nephew and his friend at Acme Feed and Seed. The place is huge and busy, and the views of the city from the top of the building are magnificent. It was a great way to end our busy day! 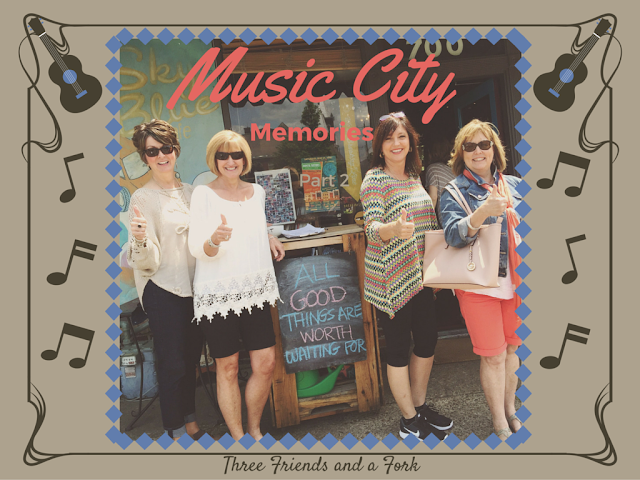 We had a great time in Nashville and can't wait for our next girl's getaway! Three Friends and a Fork give 3 big Yums UP to Sky Blue, Sinema, Chocolate FX, Galena Garlic and Acme Feed and Seed!